This classic comfort food, popular around the world, is sure to be a family favorite. 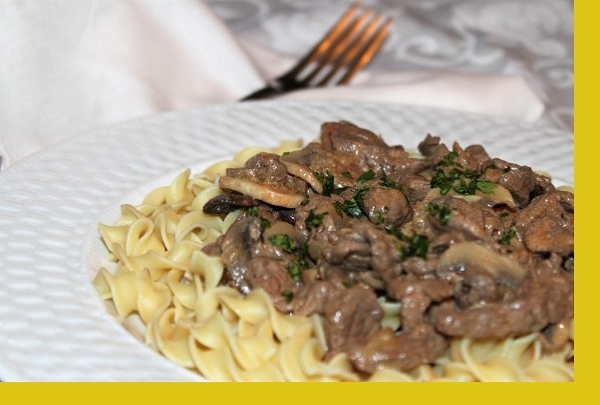 Tender strips of beef come together with mushrooms and finely diced onions in a savory sauce that's served over egg noodles. 1. Heat 2 tablespoons of oil in a large skillet on medium heat. Add meat and sauté for 2 minutes. Cook meat in batches if necessary removing each batch of meat from skillet once cooked. (Don't over cook). 2. Drain fat from skillet. Add sauce mixture to pan and bring to a boil. 3. Add meat and cook 5 more minutes. 4. Whisk in the sour cream and serve with egg noodles. Don't boil once the sour cream has been added. Very simple and quick to cook. The flavors were good, but needed a little bit of acid for more interest. The two times we've ordered this the sauce is runny (agree with other review that it's not creamy at all), and the noodles,even when not overcooked, are sticky. Perhaps the quality of noodles is low. It was very easy to make, and my husband did so while I was on the computer. He said it needed more flavoring, but I thought it was good! He thought it was good as well, but ended up adding some salt and flavorings. This was not what I expected. 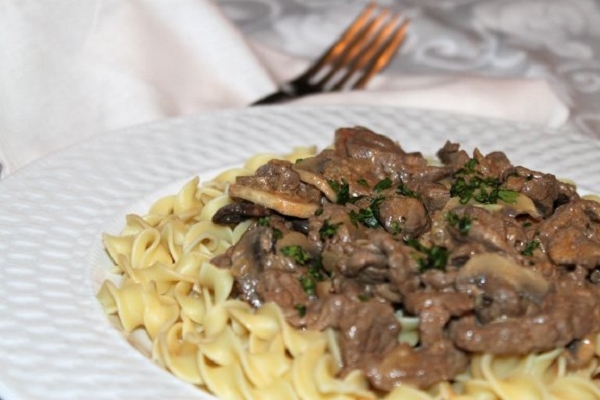 The flavor of the sauce was good, but if you're used to a nice sour creamy stroganoff like I am, this is not it. It came with 1 tbsp of sour cream for two large portions. I ended up adding a lot more sour cream to it. Whole family loved the taste of this dish! A delicious dinner prepared and served in French style.I had always served and eaten this meal with rice, but clearly, the egg noodles made a better choice for the delicious food that it is!